Crêpes, cooked on an open griddle, and filled with Nutella are popular in France. 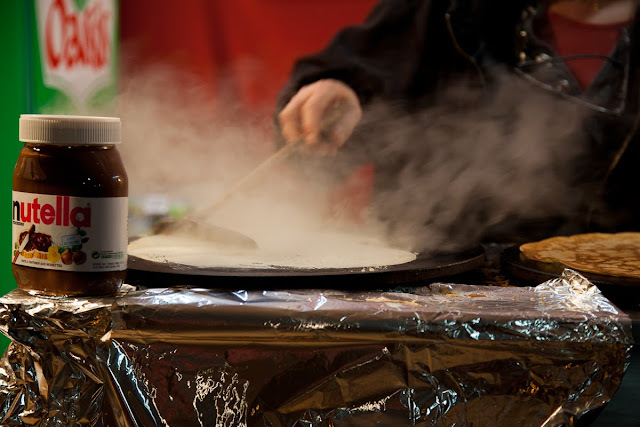 Les crêpes, cuites devant soi sur une plaque chauffante et remplies de Nutella sont appréciées en France. They're popular here, too. My kids love them with Nutella, but that's too sweet for me. I like them just sprinkled with sugar. Beautiful photo; can smell 'em. They are pretty popular at my house too! It is one of my favorite desserts with a few slices of banana wrapped inside. Yum. I was just talking about Nutella crepes the other day. Discovered them on the street near our apt. last year. I can't wait to get back to Paris (next week!) and gobble one up! Grand Marnier, s.v.p. Never developed a taste for Nutella. I think Nutella is popular everywhere! We have a restaurant in St. Paul that has an outdoor crepe stand in the summer. Not long enough for me! Now that's an idea for dinner! Thanks! Great photo, but really? I wonder if it's caught on in Brittany yet? 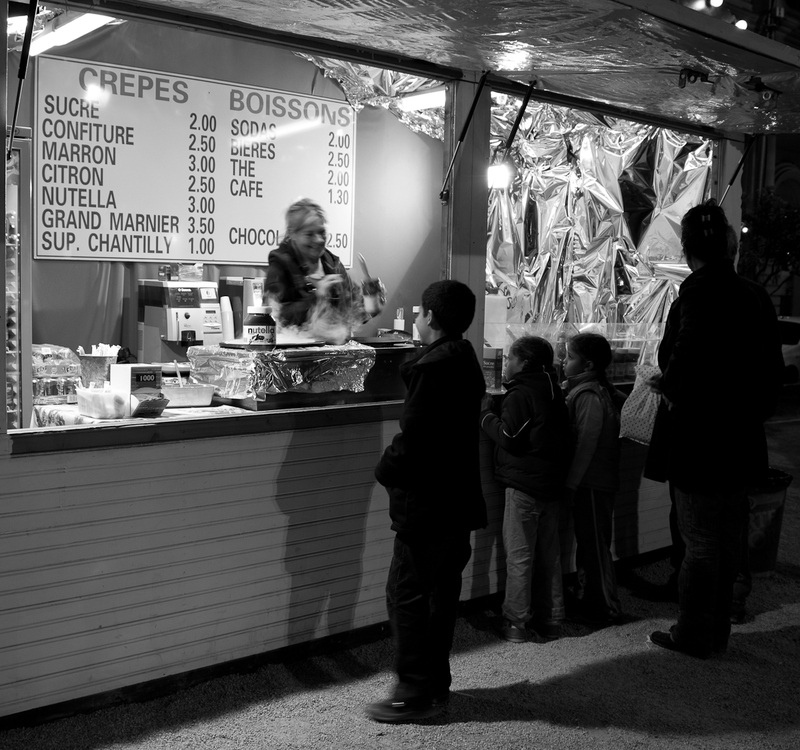 We love crepes with Nutella here too. Lovely picture. We fell in love with Nutella on a trip to Germany. My children were delighted to get "chocolate peanut butter" with their breakfast rolls. It is much easier to find here these days. I stir it into my rasberry yogurt, slop it on bananas, and my grandsons love to use it as a dip for apple slices. What a wonderful way to get a little protein and make everything else taste better. Paid advertising I hope, with such a sharp focus on the brand! My son loved those. But Nutella is so very expensive. Isn't it amazing how the makers of this product have managed to make it so popular WORLD WIDE? Outstanding marketing techniques worth becoming a case study or what?